UltraLite™, an innovative design and plastics compound that reduces weight, shipping and handling costs and waste in packaging throughout the entire supply chain. Available for reels. A large selection of open tooling available for many package types, including CSP, BGA, QFP, TQFP, LQFP, PLCC, SOIC, SOJ, SOT, and QFN. Complete system which includes the carrier tape, cover tape, reel, and p-band. 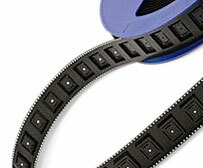 A large range of supported Tape standard widths ?8mm to 56mm. Standard Reel diameters of 7" and 13", with hub sizes ranging from 2" to 7". Fabricated using polystyrene for manufacturing flexibility, consistency and environmental recyclability, solutions are available in insulative, topically coated anti-static, or carbon filled conductive / dissipative varieties. Choice of standard Reel color (blue and white) with other colors available with special order. Maximum capacity of 12M meters of carrier tape per month.